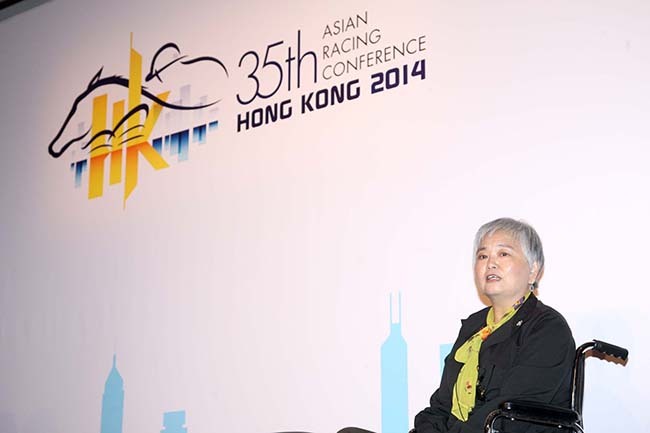 Mimi Cunningham, Director of Human Resources and Sustainability at the Hong Kong Jockey Club, and Koji Katsumi, Head of Environmental Measures at the Japan Racing Association, explained to delegates at the 35th Asian Racing Conference in Hong Kong that conserving precious resources by a whole range of initiatives is already part of racecourses’ daily operations. Mrs Mimi Cunningham, Director of Human Resources and Sustainability of the Hong Kong Jockey Club, speaks in the session. In a session entitled: ‘Racecourses and environmental sustainability’, ARC delegates were also addressed by Andrew James, a director of Populous, a global collective of architects concentrating on sports design, who outlined the latest thinking in this area with relevance to new racecourses. “Sustainability is embedded in the culture and processes of the Hong Kong Jockey Club,” explained Mrs Cunningham, who heads the Environmental Management Committee at the Club. 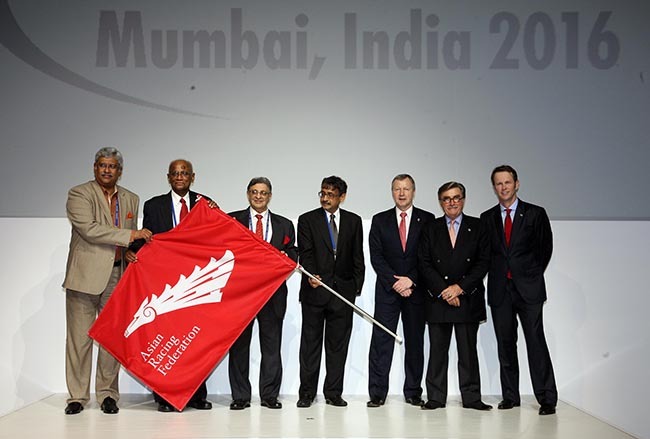 Her team has published two biennial sustainability reports, the most recent covering the period 1 July 2011 to 30 June 2013. “The Committee oversees green governance, which takes in carbon footprint, electricity consumption, supply chain management, green best practices and waste management plus water and resources conservation,” she added. The HKJC, together with the Hong Kong Quality Assurance Agency, established the first online platform in Hong Kong to report carbon emissions and progress in reducing them. “The HKJC has achieved a reduction in carbon intensity by 23.3% on our base year of 2009/10 and the Hong Kong Carbon Disclosure ePlatform aims to allow sharing of best practices,” said Mrs Cunningham. Golf carts, used for getting around Hong Kong’s two racecourses, Sha Tin and Happy Valley, are now solar powered, while 80% of food waste from racecourse restaurants is collected for recycling, and fuel consumption of HKJC vehicles, powered by biofuel diesel from cooking oil waste and grease-traps, was reduced by 5% last year. Ongoing and future projects which incorporate sustainability include the Sha Tin Communications and Technology Centre, while the HKJC Racecourse Master Plan includes the introduction of new floodlights, which reduce both energy consumption (by 40%) and light spill (by up to 85%). Mrs Cunningham reported that a new energy centre will house energy-efficient water-cooled chillers, providing air-conditioning indoors for racegoers, with a 40% energy saving. She also informed delegates that since 1984, the HKJC Charities Trust has donated over HK$778 million to green charity and community projects. Mr Katsumi, who has worked for the JRA since 1985, stressed similar themes, and reported that the JRA Recycle Action Program had achieved a 91.1% recycling rate last year, up from 85.1% in 2002. Solar power, LED lighting and natural ventilation, controlled automatically, have all been introduced by JRA racecourses. He advocated innovative technology and design for sustainable structures utilising lightweight materials, like thin film for solar power generation, as fabric roofs. “Renewable energy, maximisation of natural light and the use of light tubes are other measures which will reduce energy consumption,” he pointed out. Through directing all Populous work in the Asian region, James has been involved in designing flexible stadia, with moving pitches and changing surfaces, and he suggested that shared structures could work with racecourses, pointing to the example of the Tapei Ballpark, which is a mix of stadia and retail park.